Disruptive technologies – Cloud, Analytics, AI, ML, RPA, IOT & Blockchain” are creating enough buzz with business leaders. Silently and gradually AI, IOT and ML have made it to the list of “must have” technologies for most progressive and innovative organizations. Everyday conversation of business and functional leaders of the most progressive and innovative businesses now includes disruptive technologies. Digital will bring challenges beyond business as usual — both in opportunity for business and volume of data created. Over 90% of the data in the world has been created in the past two years, and the current output of data is roughly 2.5 quintillion bytes a day. As more organizations move from initial experimentation phase to full deployment of Digital applications like Cloud, Analytics, AI, ML, RPA, IOT and Blockchain, the data deluge will continue to plague organizations as they deal with data explosion and to capture, process, and act on the immense volume of information. Complexity is inherent to business. It is imminent when technologies overlap one another, when you add new stuff but also have keep the old as old is the foundation of enterprise applications or the enterprise applications that were built to do one thing are modified and morphed to do additional things or things they were never meant to do. Digital technologies contribute their own fair share of complexity to the already complex matrix of enterprise applications. Computational infrastructure complexity– as now it must now deal with high volume business critical data at a scale and speed to provide real-time and near-real time analysis and analytics for AI, RPA or machine learning. Staggering integration issues due to proprietary, sometimes non-interoperable standards, new protocols, debugger workflows, new libraries or the distributed ledger. As the landscape starts becoming complex, it become tougher and more expensive to manage. Existing enterprise architecture can’t cope with either meeting business demands or increasing business efficiency. In certain cases, it can even starts failing. This is a completely unacceptable situation. Just as the impact of misinterpretation of business strategy reverberates throughout the entire enterprise architecture as unnecessary complexity, reverse is true too. 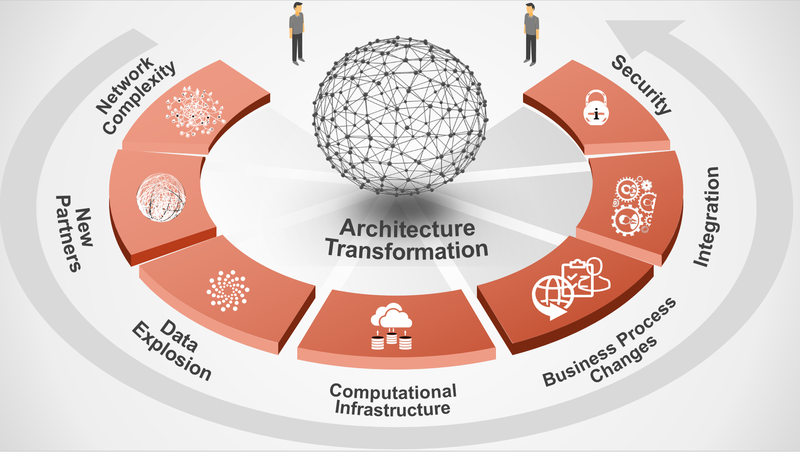 CIOs need to ensure an architecture that is agile enough to meet today’s changing demands and robust enough to sustain business critical processes. They must simplify enterprise architecture to deal with the complexity of disruptive technologies. While there are well established architectural patterns for applications and solutions — enterprise architecture patterns are quite difficult to find. The traditional framework of classifying enterprise architecture to Business Architecture, Information Architecture, Application Architecture and Technology Architecture too doesn’t suffice as disruptive technologies very often create overlaps. Segregating the architecture to a portfolio of architectures works best in such situations and enables CIO in defining the end-state portfolio blueprint. Disruptive technologies will have significant impact on some portfolios and minor impact on some. Depending upon the impact, a consortium of architects can simplify the various portfolios and create metrics and SLAs. Simplification of UX and omnichannel experience to all users across devices and platforms one of the basic tenets and the foremost architectural challenge of all disruptive technologies. Disruptive with the real time and near real time analytics requirements calls for innovations in the way operational data is managed and thus a dedicated architectural assessment and management. Disruptive leads to explosion in data. Even when the logic is about small incremental investments in disruptive – a DW/ Storage architecture must be audited and transformed if needed to manage the complexity of data storage, integration, sharing and decision making. Disruptive brings the spotlight on a more mission-critical/business-critical role of the network core and network infrastructure. Distributed ledger and proliferation of nodes require a dedicated assessment of network architecture. The brave new world of disruptive technologies takes decision making to new levels by integrating various stakeholders and automating the processes to get things done. Consider the case of Asset Information Network, where equipment users, service providers and OEM collaborative monitor the vital statistics of equipment performance and can proactively dispatch maintenance crew with right parts and skills in case of equipment failure with any need of manual intervention. With this level of change in business process and integrations, there is a need for a new architectural portfolio for robotic process automation and remote operation centres. Disruptive or no disruptive, the classic business processes are here to stay and so if the ERP architecture that can manage the enterprise applications. With non-standard protocols in play, the need for ESB architecture simplification is all time high. Cloud is another important tenet of most disruptive technologies thus creating a need for Cloud architecture. Disruptive technologies are still in nascent stages. CIOs are taking small incremental steps. The scalability of infrastructure and applications is vital. This makes the traditional SOA holds good to manage not just the implementation complexity but also the scalability. Disruptive brings to consideration large amounts of identifiable and unidentifiable data with uncertainties of public, private, limited shareability nature of data. A dedicated SOC architecture can enable CIOs define what to protect from whom and how and also deal with the legal, regulatory and rights issues around data. Simplifying architecture is not a one-time job. If you don’t have a proper function to manage it, complexity will come back again. CIOs have to be committed to dealing with logical complexity. With ETC in place, the daunting task of streamlining and connecting this new way of working marred with different kind of standards, API, protocols, communication mechanisms, scalability, data and analytics requirements to back-end applications and users becomes manageable. What are your views? Let me know and feel free to share and like. This article represents my own thoughts and ideas and not necessarily the ones of my employer.